I have an on-again-off-again relationship with Games Workshop’s Warhammer 40,000. 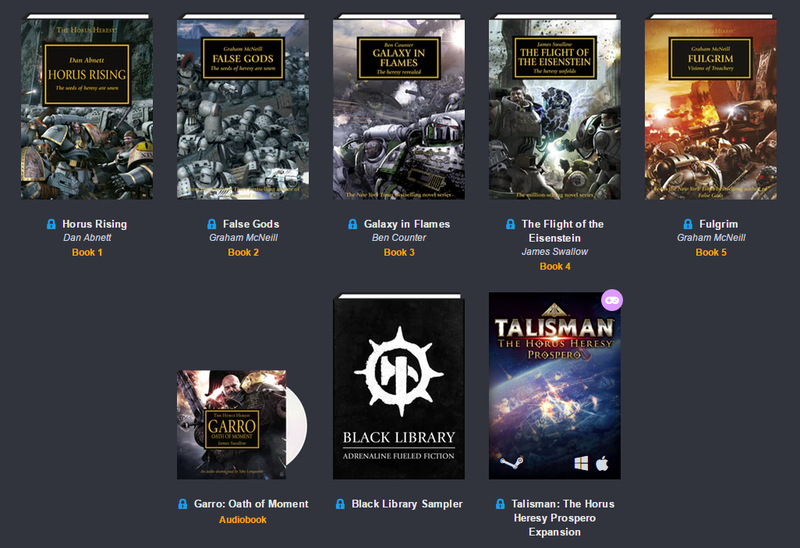 There are plenty of reasons that anyone might have such a relationship, but something I do like, and which I keep coming back to, is the fiction put out by GW’s publishing arm, The Black Library. One series that garnered BL particular acclaim is the Horus Heresy series. The events of the Horus Heresy are basically the origin story of 40K itself, covering the aftermath of the great crusade that saw the Imperium of Man’s expansion across the stars and the tragic fall of the Emperor’s favoured son. This bundle gathers many of the books in the series, as well as a few cool extras. The first tier of this bundle costs only $1. and contains books 1 through 5 of the series. I’ve read all of these titles and really enjoyed them – especially the first book, Horus Rising, which expertly sets the tone for the wider series. This tier also include one of the fantastic audiobooks, a sampler and an expansion for a Talisman-based game on Steam. The second tier, priced at $8, includes the next 5 books in the series. I’ve only read one of these, Mechanicum, but I did love the new perspective it gave me on the priesthood of Mars. It also includes another audiobook, and we can see a wee theme developing here as it is another Garro title. All three of the tiers contain Garro titles, and he is a pretty cool character. The book I’m most keen to read in this tier is Legion, as I’ve always found the idea of the Alpha Legion chapter to be quite interesting. Finally, the third tier gives another 5 books, including two of my absolute favourites in the form of A Thousand Sons and The First Heretic. I’m keen to follow up on A Thousand Sons by reading Prospero Burns. 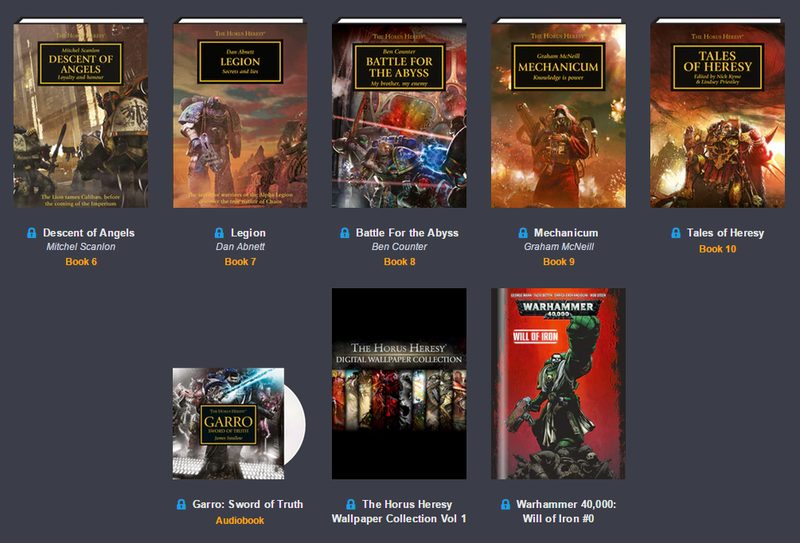 Again, we have a Garro audiobook, but we also have some other cool extras, including a graphic novel and an artbook. Not bad for $15! I suppose it evens out to a dollar a book, with the extras chucked in for free. 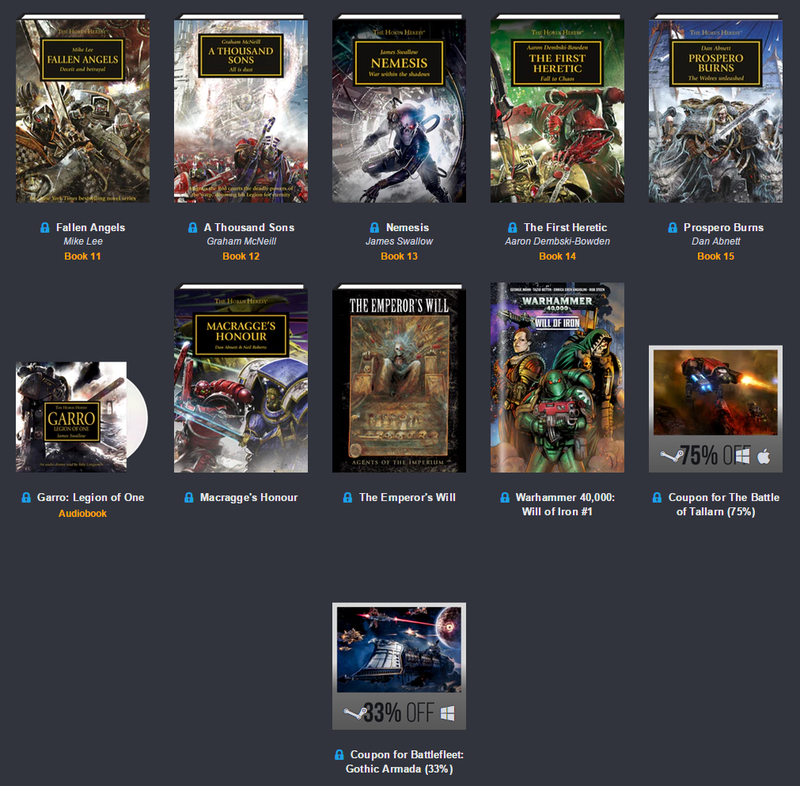 The bundle can be found over at the Humble Bundle website and will benefit the United Nations High Commission for Human Rights. This is one that I’ll be getting in on!